At the 2016 CES, I was part of team giving presentations to the press in one of Samsung’s demonstration rooms of High Dynamic Range video from a variety of sources including Samsung’s new UHD Blu-ray player that will be available in late February or early March. I had the good fortune to be working with Florian Friedrich of AVTop who arguably knows more about HDR video than anyone in our industry. Florian has shot, color graded, and produced his own HDR content and test material. 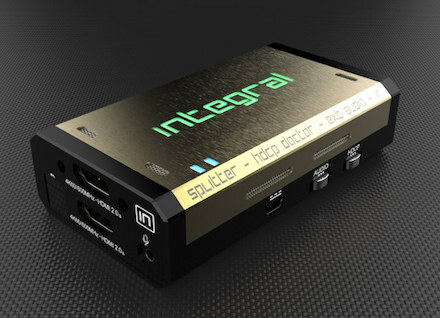 He also worked closely with HDFury, a Chinese manufacturer, so that with a touch of a button the Integral is able to inject the HDR metadata into the video stream. There will also be a AVTOP Software to provide detailed control over all HDR metadata parameters defined by CEA 861.3. And as I came to learn from him, the implementation, evaluation, and ultimately the calibration of HDR capable display devices is far more complex than I had thought it would be initially. So what is HDR video? You may know that High Dynamic Range has been available in still photography for many years. Now with UHD (Ultra High Definition read:4K) sources like the new UHD Blu-ray format, and some streaming services like Amazon, we have UHD HDR video content available for use on UHD HDR capable displays. Unfortunately, HDR comes in a few flavors making it somewhat confusing to the average consumer. The two most popular at the moment are Dolby Vision, and HDR-10. Dolby Vision is a licensing business model that stands to make Dolby significant licensing revenue. Vizio, and as of the 2016 CES show, LG are in the Dolby Vision camp. HDR-10 on the other hand appears to be a more open standard that will allow for flexibility of the specifications as the new UHD system evolves in the future, and does not require any licensing. It is supported by all of the members of the UHDA (Ultra High Definition Alliance). Technicolor in collaboration with Royal Philips has also announced their own version of HDR with a licensing business model. HDR-10 video employs a radically different gamma curve referred to now as EOTF (Electro Optical Transfer Function) known as PQ (Perceptual Quantization) gamma or SMPTE 2084, very high light output, wide color gamut (DCI or P3 color space), and very high contrast ratio. On LED backlit LCD displays that are capable of accurately reproducing all these aspects of the HDR content, images are delivered with far more detail in both the darker areas of the picture and in brighter areas as well. For example, speculative highlights like a small bright sun setting in the distance with a much darker background will have far more detail in the sun than the same image being produced by an SDR Rec 709 color gamut display. Having done direct A/B comparisons of HDR content with P3 color gamut versus the same content graded for SDR Rec 709 on Samsung’s 2015 flagship UN65JS9500s for the past year or so, I can tell you that the HDR images are far more compelling, and have far more detail in them. When you hookup a regular signal generator to the HDMI input of the Integral, and then run an HDMI cable from the output of the Integral to the display device, you can then toggle back and forth between SDR and HDR output to the display. So effectively it is turning the normal SDR test patterns in the generator into HDR test patterns when the Integral is in HDR mode. This is the first step in being able to evaluate and calibrate HDR capable displays. Click on the link for a demonstration on Florian’s website: http://hdr.avtop.com. Unfortunately as of this writing SpectraCal’s CalMAN software does not provide a workflow and report for HDR so we can’t really evaluate or calibrate for HDR yet. The next step is to get a workflow and a report in CalMAN that will work with the Integral and the generator you choose to use. Finally, it should be noted that SDR test patterns are useless in the evaluation and calibration of the HDR aspect of a UHD display. To further confuse the issue, it seems that at least most of the legacy test patterns that we have been using for decades also will not work so new test material must be made. The good news is that the industry is hard at work on providing these missing links so that in the near future we will be able to provide calibration service for HDR playback to consumers with high end HDR capable UHD displays.